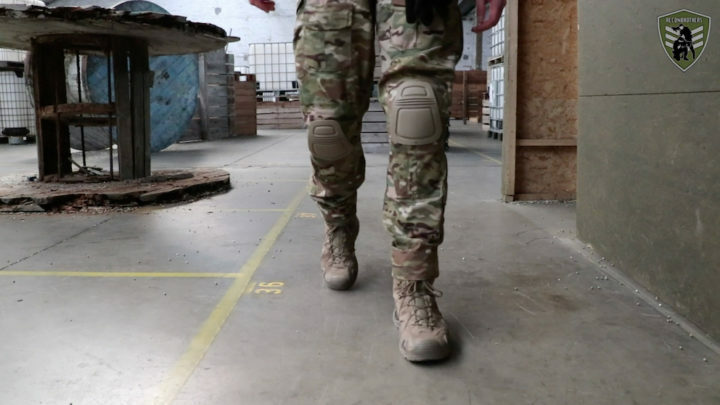 In our experience on the airsoft field we’ve seen a lot of people wearing the wrong kind of boots. This mostly leads to people hurting themselves due to the rough and sometimes slippery environment. 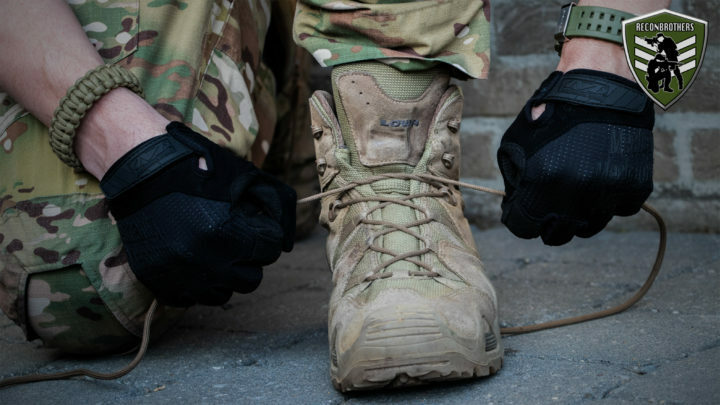 Whether you are doing airsoft, milsim or any other outdoor activities, having a foot injury almost always means game over! This is why knowing what boots to buy is so important. 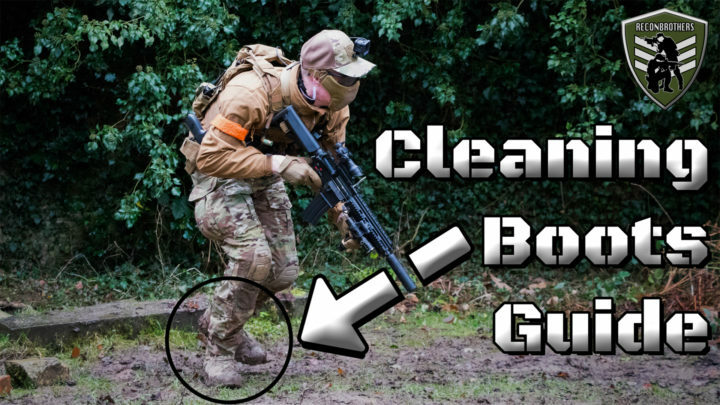 In fact we believe that boots are equally important as getting the right eyewear for doing airsoft. While eyewear protects your eyes from any kind of injuries, boots will protect your hard working feet. 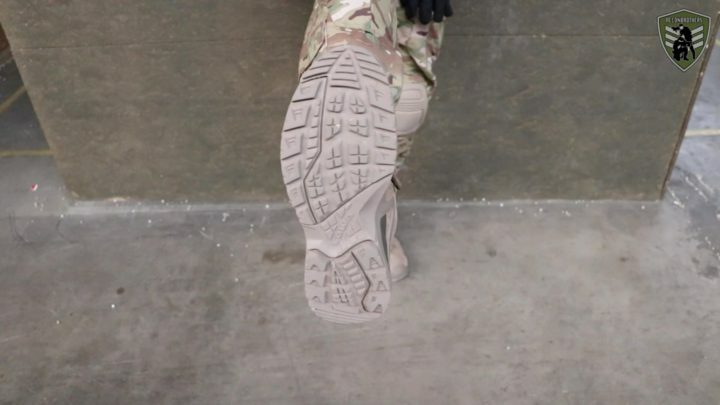 Beneath you will get to know the key features that make up a good tactical or hiking boot and learn 3 easy tips to know if they fit you properly. A high ankle support provides your feet with the right amount of stability to deal with rough terrain. This is especially important when moving downhill. The support provided for your ankles also prevents injuries, like rolling over your ankles for example. An anti-slip sole is key to prevent slipping as much as possible in wet conditions or slippery terrain. 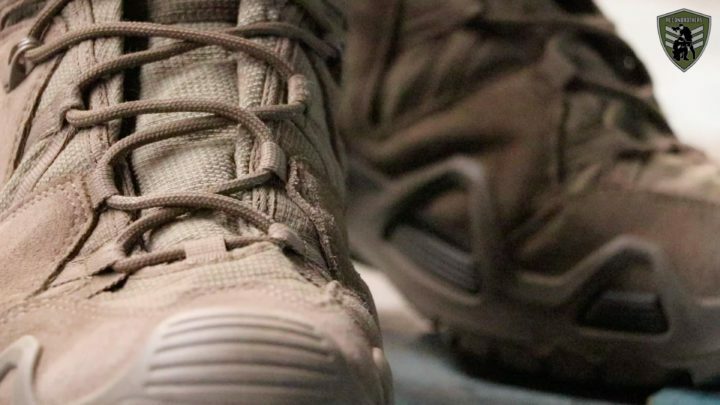 A proper reinforced shoe tip protects your toes from hitting any kind of hard surfaces. This is especially a high risk when moving downhill. Laces exist in both synthetic or cotton material. It is highly recommended to look for synthetic laces because cotton laces absorb moisture and become very hard to untie. Boots can be made in both leather or synthetic material. It’s important to know the difference between these two materials because they are meant to serve you in different ways. Synthetic boots are in general much lighter and have a shorter break-in period than leather boots. Here the “break-in period” being a period of time your boots need to adjust themselves to your feet. 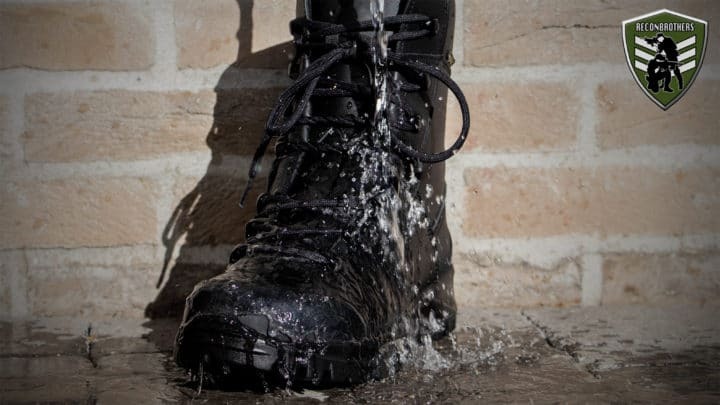 Leather boots, when not being waterproofed, have the downside of absorbing a lot of moisture and thus can become very heavy. After usage they also need a longer recovery time than its synthetic counterparts. But leather boots will probably fit you best when you have to deal with more extreme environments due to their higher endurance rate. Going outdoor also means facing wet conditions, this is where the TEX-membrane comes into place. This is a layer that is being placed between the inner and outer layer of the boot. 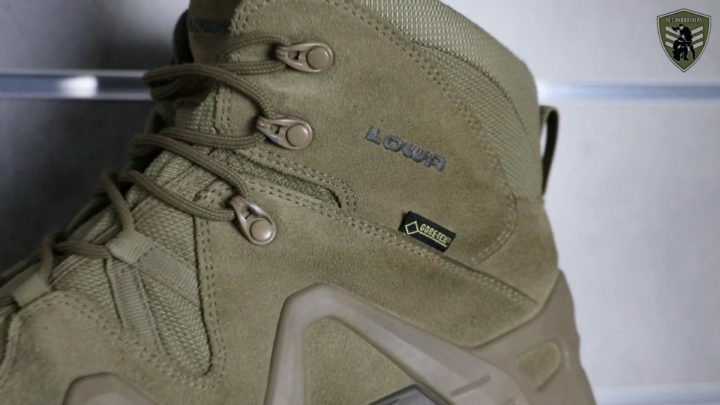 The function of this layer is to make your boots both breathable as well as keeping them waterproof. While the inner layer is protected because of this membrane, the outer layer is not and needs some extra care. This is where waterproofing comes into place. When fitting boots, you best use the same socks that you will be using outdoor. For this we highly recommend to get outdoor socks, which will absorbs shocks and transfer moisture from your feet to your boots. The boots will on their turn transfer the moisture to the surrounding air. Make sure to tie your boots and walk around to feel if they are comfortable. 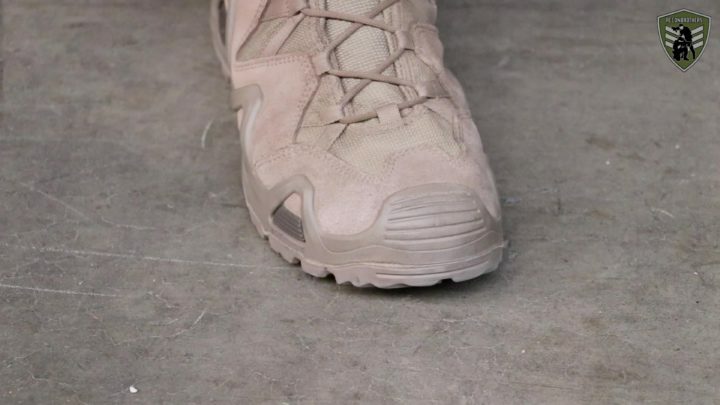 If they don’t feel comfortable, try another pair because comfort decides whether you are able to face hard terrain and endure long periods of time. 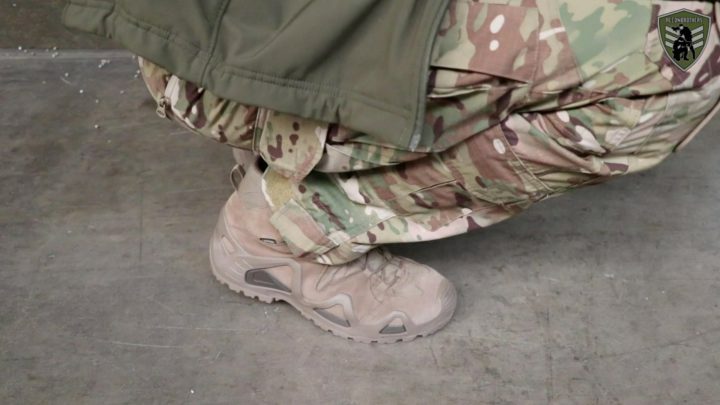 To make sure you have the right size of boots, you want to make a crouch position and feel if your toes touch the front end of your boots. If this is the case then you need a bigger pair. Know someone that urgently needs to replace his old boots? Help him/her out by sharing this blogpost so he/she can make the best decision for getting a new pair.